calling me a crow in Geba (horse stop). Rather a black kite in spite of crow. 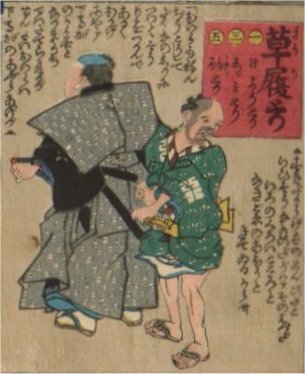 As old comic poem says, you wear tabi (socks) in Osaka, zori (sandal) in Kyoto, geta (clogs) in Edo. The road condition of Edo was so bad. People in Edo developed special elaboration in geta due to mud everywhere on the street. Zori fits to foot steps comfortably but is weak agains mud.